During the MDG era, maternal mortality and under-five child deaths have been halved, with a number of low- and middle-income countries achieving MDG 4 for child survival. Peru is an example of a middle-income country that has made exceptional progress, having met both MDG 4 and MDG 5. 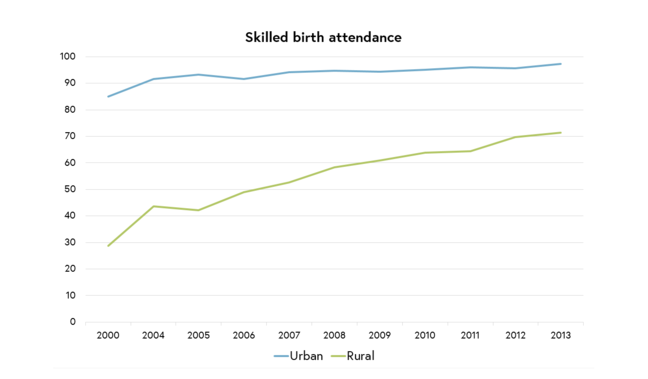 This case study, summarised by Sarah Moxon and Dr Luis Huicho, outlines the remarkable progress they have made for newborn deaths, and how they have reduced their national neonatal mortality rate by more than two thirds (Figure 1). There has been increased coverage of key health services (Figure 2), including family planning, antenatal care and skilled birth attendance.1 The improvement in coverage of these indicators, alongside wider socio-economic development, has been vital to progress in reproductive, maternal, newborn and child health (RMNCH). However, data on coverage and quality are lacking, especially in measurement for care of small and sick newborns and the shift towards intensive care for newborns. Unfortunately the case study did not present data on stillbirths and time trends. What has been responsible for Peru’s MDG success? Sustained investment in integrated programmes, such as the maternal-neonatal health and child nutrition programmes, have been key to Peru’s success. Policy has shifted from vertical child survival programmes, with a focus on acute respiratory infections, acute diarrhoeal disease, and immunisations, towards integrated programmes that specifically include neonatal care. 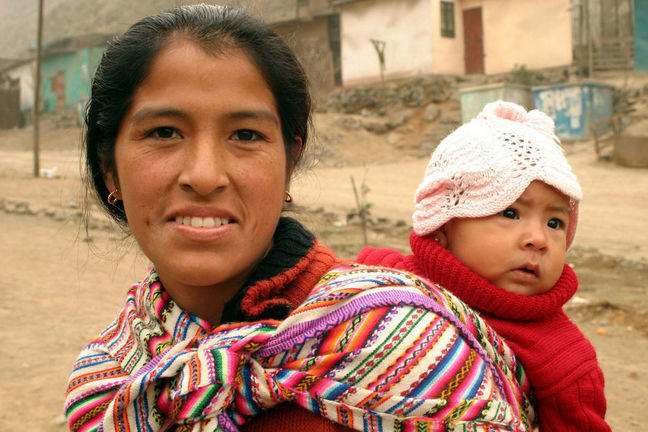 Since 2002, the Peruvian Government has introduced the Comprehensive Health Insurance Scheme, which includes free access to health care for children younger than 5 years as well as for pregnant women, and specifically the poorest women, children and newborns (Figure 3). 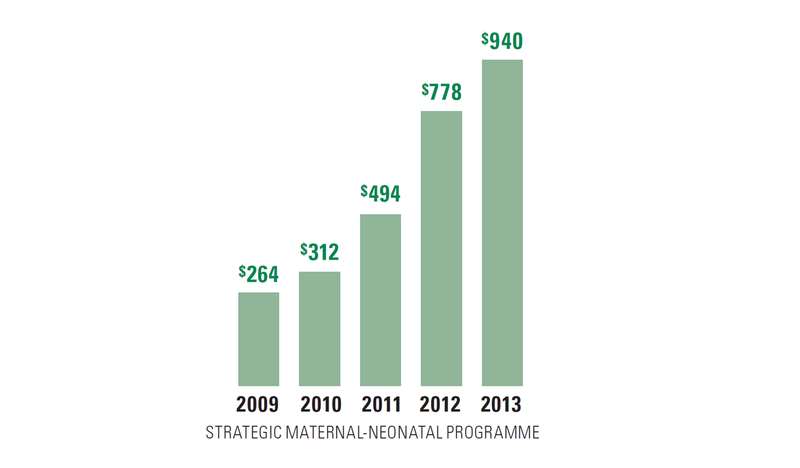 The cost of inpatient care for a sick or premature newborn can be financially crippling, especially for poor families, and health financing policies in Peru now cover hospital admissions for care of sick newborns. The Strategic Maternal-Neonatal Health Programme, which focuses on increasing coverage of emergency obstetric and comprehensive neonatal care at the national level, includes facility-based care for newborns, such as special care and neonatal intensive care. The Integrated Management of Childhood Illness (IMCI) programme was recently adapted to include a neonatal care component, which is vital for identifying neonatal infections, especially in rural communities. 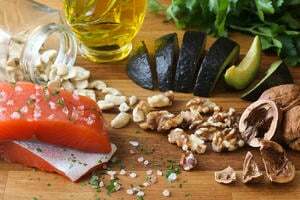 In addition to IMCI and since 2008, a cross-cutting Articulated Child Nutrition Programme with particular emphasis on children younger than 3 years has been integrated. All of these programmes have incorporated a combination of training, supportive supervision, multi-skilled teams, adherence to evidence-based guidelines, and rights-based and culturally adapted care of pregnancy and delivery. In 2014 the government launched the Welcome to Life plan (Bienvenidos a la Vida), which seeks to provide benefits to newborns until the age of three, including breastfeeding information, accessories for baby care and a certificate of Comprehensive Health Insurance. How were gaps closed for the poorest populations? How much work remains? Peru’s health investments were explicitly focused on narrowing equity gaps and giving priority to vulnerable populations living in extreme poverty, with a 10-fold reduction in the equity gap for child mortality between the poorest and the richest. 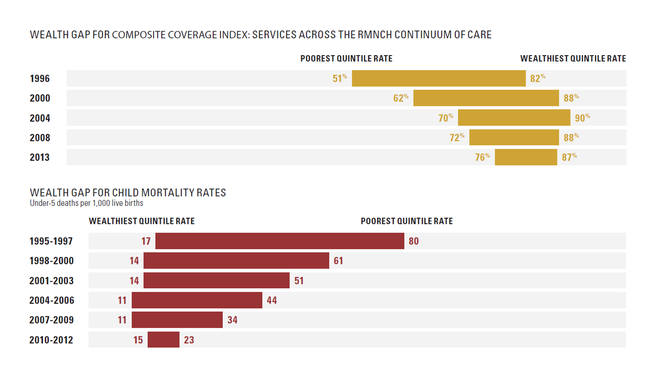 There are many examples of pro-poor and rights-based approaches to close the facility coverage gap for rural births, including the introduction of vertical deliveries and prioritisation of maternity waiting homes for pregnant women and ensuring rural communities can access the appropriate level of care when their baby is sick. Various social inclusion programmes, such as conditional cash transfers (JUNTOS) have involved the public and private sector in their implementation with results-based budgeting linked to key indicators. This progress is remarkable considering the challenges to reach the poorest families and those in geographically remote areas or specific minority groups. However, equity and measurement gaps remain, and work must be done to measure interventions for newborns such as antenatal corticosteroids for the management of preterm labour, basic newborn care, resuscitation and the care of small and sick newborns, including treatment of infections and Kangaroo Mother Care. Newborn outcomes are a sensitive test of health system function. Continued efforts are needed to sustain Peru’s progress and go beyond survival; achieving this will require a data driven process to sharpen national health plan investments, and equitable implementation to continue reaching the poorest populations.